Make the most of Windows Live Messenger, thanks to WLM Universal Patcher++, a free patch that manages to eliminate the bothersome publicity that appears camouflaged in the windows of our favorite messenger client. It you are one of those people that can easily lose concentration due to any distraction, you will surely lose track of your conversations when the bothersome publicity of this popular messaging client appears. If you want to enhance how Windows Live Messenger works, you can with WLM Universal Patcher++. It is a simple application that disables all publicity that the application might try to launch: publicity banners, ad bars,... What's more, it allows you to enable or remove other elements like the MSN search or the control panel. And if you want to return "Messenger" to its original status, simply click on "Restore". 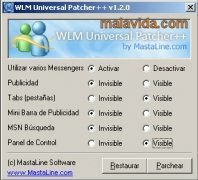 With WLM Universal Patcher++ we can enjoy Windows Live Messenger without adverts and customise it to our liking. 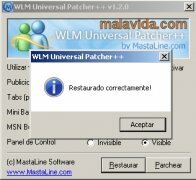 To use WLM Universal Patcher++ it is necessary to have Windows Live Messenger installed.